NYCTA’s Attempt to Dismiss Claims of Injured Passenger Denied - Leandros A. Vrionedes, P.C. In a claim that recently came before the Second Department of the New York Appellate Division (including Queens, Kings, Richmond, Nassau & Suffolk counties), the judges refused to dismiss the personal injury lawsuit filed by a bus passenger who was thrown to the ground by a sudden and abrupt stop. Read more about the woman’s claims and the court’s decision below, and contact a seasoned Manhattan public transit injury lawyer if you’ve been hurt in an accident on New York’s public transportation system. The recent case, titled Gani v. New York City Transit Authority, was based on injuries a passenger received while riding an NYCTA bus. The injured plaintiff, Jamilah Gani, was riding the bus when, she claimed, the driver’s sudden and violent stop threw her to the floor and from the front to the middle of the bus. Gani filed a claim against NYCTA for her injuries, and the NYCTA filed a summary judgment motion to have her claims dismissed. Sudden stops and jostling are everyday occurrences on New York public transportation; passengers may even trip and fall when stops come more suddenly than anticipated or the passenger could not reach a pole or strap to stabilize themselves. However, only where a stop is uncommonly violent will a passenger have a claim for compensation against the driver or transportation provider. The Appellate Division explained that, when an injured passenger claims they were injured by a bus driver or other common carrier’s negligence in bringing the vehicle to a stop, that victim can only win by showing that the “stop was unusual and violent, rather than merely one of the sort of jerks and jolts commonly experienced in city bus travel.” (internal quotations omitted.) That said, a defendant can have such a claim dismissed only by proving that the stop was not unusual and violent. Defendants can use evidence such as the victim’s description of the accident to show the nature of the stop. In this case, the plaintiff’s testimony that she was “propelled to the floor and from the front to the middle of the bus” was sufficient to raise a legal question of whether the driver’s stop was “unusual and violent,” going beyond the normal jostling involved in a bus ride. Since the NYCTA could not introduce evidence to contradict the plaintiff’s claim, her claim will now move forward to trial. 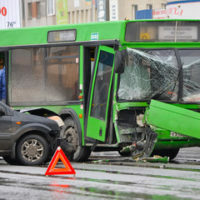 If you’ve been the victim of an injury accident on New York transit, find out if you’re eligible to file a claim for money damages by contacting the seasoned and effective Manhattan bus accident lawyer Leandros A. Vrionedes for a free consultation at 212-889-9362, or in Queens at 718-777-5895.